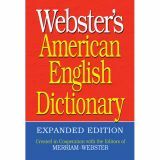 This new, expanded edition provides definitions, pronunciations and variant spellings for the words that make up the core of the English language. 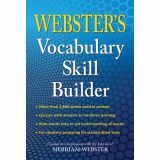 Features 40,000 clear, concise definitions, common abbreviations, plus special sections such as biographical Names, English Word roots, and Basic English Grammar. Paperback. 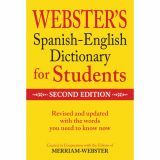 512 pages. Two essential writing resources for students in one great set! 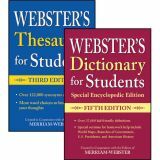 2-book set includes Webster's Dictionary for students, special Encyclopedia Edition, Fifth Edition and Thesaurus for Students. Revised and updated, this set is the perfect companion for class work and homework. 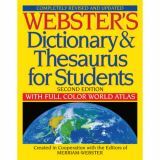 An invaluable tool for students learning writing skills, this revised and expanded thesaurus is designed to make it easy to find the best word to express an idea. 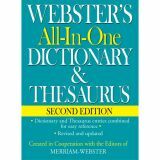 Includes 122,000 synonyms, antonyms and related words. 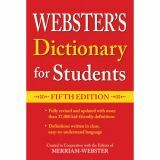 Main entries have shared meaning core followed by a list of synonyms, related words and antonyms. Paperback. 352 pages.